Valentine's Day is a few short weeks away. Here are our Top 12 Quotes for Valentines Day. These are the best quotes about love to gift to your Valentine (whether girlfriend, boyfriend, wife, husband, partner). They are especially fit to be framed - on your wall or on a shelf. 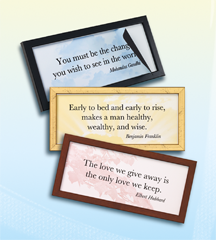 Of course these quotes are also perfect reminders of what matters most - not only on Valentines Day, but all year round. To have any of these printed for framing at Quote Palettes, just click here. Thousands of inspiring, enlightening and entertaining quotes cannot be traced back with certainty to one source. Here are some of our favorite quotes for the wall without a known author. If anyone can show us evidence of the original source of these quotations (sorry, we love Brainyquote but it doesn't count as a primary source), please share your research. Based on our research, however, we will continue to credit these to Anonymous, who also said, "Write a wise saying and your name will live forever." To see all Anonymous quotes or get any of these quotes printed for your wall, click here. A friend is the first one to come in when all the world goes out. Blessed is the person who is too busy to worry in the daytime and too sleepy to worry at night. God gives us dreams a size too big so that we can grow into them. The smartest thing I ever said was, Help me! I kept looking for somebody to solve the problem. Then I realized I am somebody. Time may be a great healer but it's a lousy beautician. In the game of life, nothing is less important than the score at half time. Life is just a phase you're going through; you'll get over it. Smart people speak from experience. Smarter people, from experience, don't speak. The trouble with political jokes is they get elected. If voting changed anything they would make it illegal. The reason academic politics are so bitter is that so little is at stake. There ought to be a better way to start the day than by getting up in the morning. When at night you cannot sleep, talk to the Shepherd and stop counting sheep. What a shame to tiptoe carefully through life, only to arrive safely at death. It takes seventy-two muscles to frown, but only thirteen to smile. Nothing kills a bad product faster than great marketing. There is no limit to what a man can do or where he can go, if he doesn't mind who gets the credit. Amateurs practice until they can get it right; professionals practice until they can't get it wrong. If you want the best seat in the house, move the dog. "The first hour of the morning is the rudder of the day." You don't have to be a sailor to understand what Henry Ward Beecher was saying. As Benjamin Franklin wrote, "The muses love the morning." Whether or not you consider yourself to be a "morning person", the quality of a day often depends on how you spend the first one or two precious hours. You have a choice. Focus on important, long-term projects that call for creativity and concentration (good); or read all the emails you were cc'd on (for no good reason), put out fires your boss started, and schedule a bunch of useless meetings (bad). The first hour of the day is the best time to read anything that reminds you of your values and helps you focus on your goals. That's where great quotations come into play. A perfect place for a quote is the kitchen or office wall, right where you have your first cup of coffee or tea each day. However you choose to spend that first hour, resolve to make the majority of your mornings count. You'll be navigating life more effectively in no time. Have a good morning and a great day. Copyright Echo Mine LLC. Simple theme. Powered by Blogger.